Tugs—just the name brings up pictures of crowded, busy harbors and probably the toughest job in the marine industry. Because service, not excuses, is expected regardless of rain, hail, snow, fog, time of day or year. 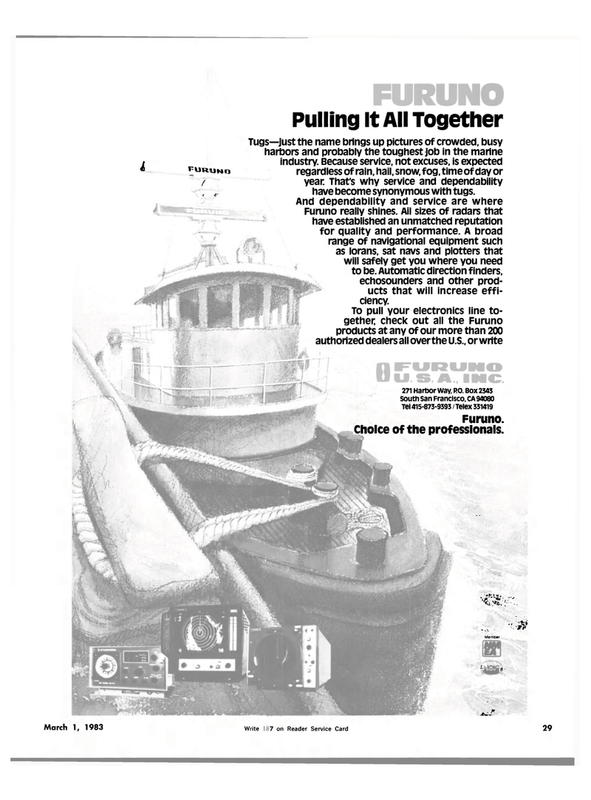 That's why service and dependability have become synonymous with tugs. And dependability and service are where Furuno really shines. Ail sizes of radars that have established an unmatched reputation for quality and performance. A broad range of navigational equipment such as lorans, sat navs and plotters that will safely get you where you need to be. Automatic direction finders, echosounders and other prod-ucts that will increase effi- ciency.